A community is a place where people live and work. “Community helpers” are people in our community that help others live their daily lives. 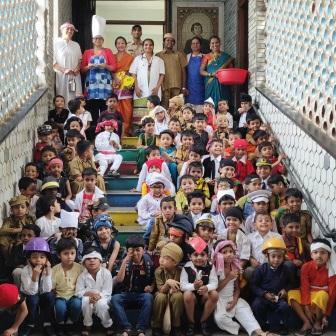 Community helpers’ day was celebrated in the Jr Kg on Fri 15th March 2019. I teach students, who am I? I catch robbers, who am I? I treat you when you are sick, who am I? These were some of the questions which were promptly answered by the Jr. Kg boys as they came dressed up as different community helpers along with their respective tools. They spoke confidently, describing their outfit and the tools brought along. Some of the parents came dressed up as policeman, doctor, lawyer, carpenter, fisherwoman, etc describing in detail their respective roles. It was a fun day indeed, as the boys went home learning a lot more about various other community helpers.